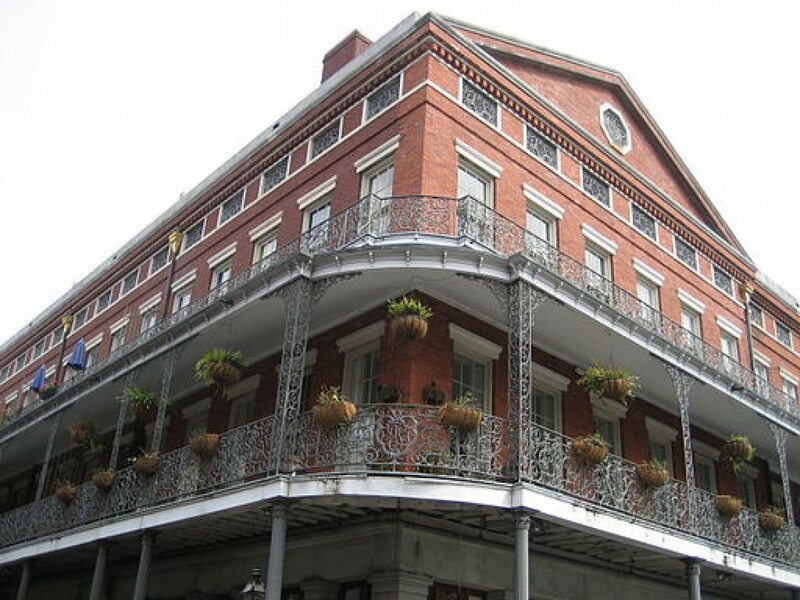 Pontalba buildings are evocative of the decadent and elegant architecture that define New Orleans. Forming two sides of NOLA’s famous Jackson Square in the French Quarter, the matching red-brick expand one city block with four stories. Dating to the late 1840s, they were built by Baroness Micaela Almonester Pontalba. Today, the ground floors of the buildings hosts shops and restaurants, while the upper floors remain apartments which, it is said, are the oldest continuously-rented apartments in the United States. A successful businesswoman, the Baroness Pontalba invested in real estate properties and purchased large parcels of land on the upriver and downriver sides of the Place d’Armes. During the 1840s, she constructed two Parisian-style row homes for over $300,000. From 1849-1851, architect Henry Howard served as the main designer of these red-brick buildings. Each building included the first recorded use of iron railings which is now a prominent feature in the city’s residential architecture. In fact, after the buildings’ cast iron verandas were built, they became vogue for the iron galleries known throughout New Orleans today. The Upper Pontalba faces the Rue St. Peter which lies upriver from Jackson Square. On the other side, the lower Pontalba Building faces Rue St. Ann. The Baroness was said to be the supervising architecture and, according to eyewitnesses at the time donned man’s pants to ascend ladders during the buildings’ construction. She later lived in apartment #5 at 508 St. Peter St. with two of her sons. Her son, Gaston, may have designed the AP monograph in the building’s wrought iron. After the Baroness Pontalba died in France in 1874, the Pontalba family claimed ownership of the buildings until the 1920s. However, during their tenure they did not upkeep the townhomes and they remained neglected for many years after the Civil War. These heirs sold the property to William Ratcliffe Irby, who then sold it to the Louisiana State Museum. The upper building was later acquired by local civil leaders, but it was later sold to a foundation in 1930 called the Pontalba Building Museum Association. Since the 1930s, the upper building is owned by the City of New Orleans. Although many people believe they were the first apartment buildings, this fact has been disputed by historian Christina Vella who said that they were originally build as row homes. Later, these row homes were turned into apartments during the 1930 renovations of the Great Depression. In 1974, the Pontalba Buildings were declared a National Historic Landmark for its early and distinctive architecture. There are thirty-two stately row houses in all, sixteen on each side and include three stories and an attic. The exterior of the buildings are made up of long galleries (like porches) with wrought-iron frames that contrast both French and American styles. However, the floor plans are Creole. The downstair stores and doors lead to passageways instead of stair halls. At the end of these dark passageways, the stairs curve gently to the upper floors to allow the privacy of the residents. The downstairs walkway shelter customers and, in the past, it part of Creole custom to live upstairs on the second and third floors, the deuxieme etages. These elegant Pontalbas created more development in Jackson Square. In response to the Madame’s building plans, the council began to create its own building program. The Cabildo and Presbytere building soon had third floors along with the French-style Mansard roofs as popularly seen in 19th century Paris. Later, church wardens allowed a major architectural contract with de Pouilly to rebuild the cathedral. Then, the council had the city surveyor design and build the iron fence around the square with internal landscaping. Soon after the buildings development, the main These buildings helped to redefine and beautify a main commercial area in New Orleans, allowing cultures to integrate and share their languages, arts, and histories with one another in the center gardens. Today, the original sixteen townhouses in the upper building have been converted to 50 apartments, with one used by the Mayor while the others are rent-controlled. The lower building uses the same model. Visitors can still shop and eat at the numerous sights along the ground floor walkways. In the lower Pontalba, restaurants like Chef Scott Boswell’s, Stanley!, and other nearby restaurants act as commercial draws to the area. In the upper Pontalba, restaurants like Cafe Pontalba, The Corner Oyster House, and PJs Coffee Shop remain mainstays. Today, the buildings still serve as a way to blend culture and integrate different communities within this famous architectural and commercial hub. It’s a sight of architectural marvel and beauty worth seeing in New Orleans — especially while you enjoy a beignet.